Need to verify a support client's order history, serial number or eligibility for support and upgrades? 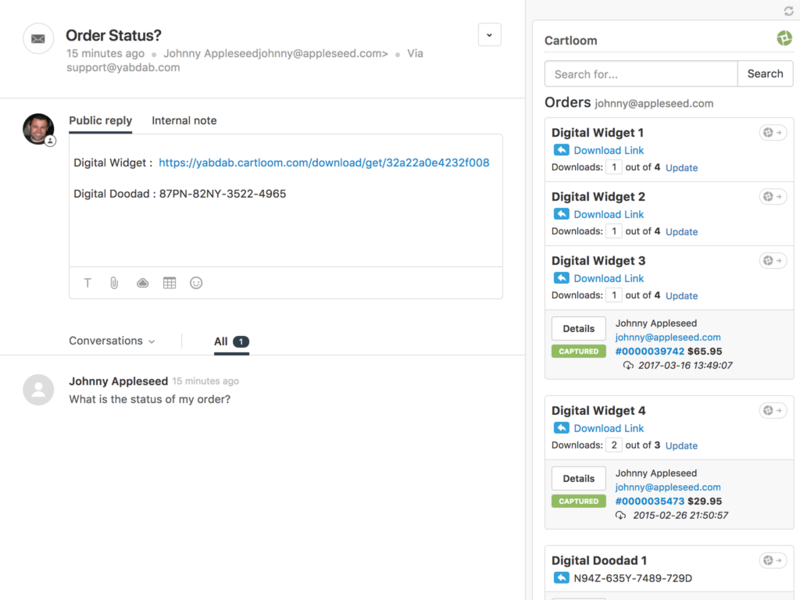 The Cartloom app for Zendesk pulls in detailed order information from your Cartloom.com ecommerce account. View purchase history right next to your support tickets. 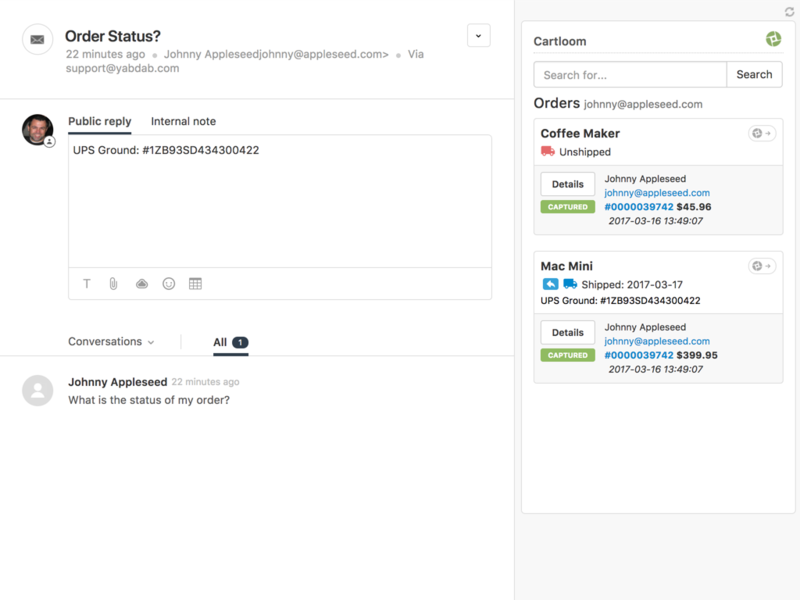 Allow your agents to efficiently respond to order related queries by placing order info right into Zendesk! Verify purchase history without leaving Zendesk. Automatically loads Carloom order history based on customer email address. Allows manual search of alternate email addresses. View summary or detailed invoice for each order. Use purchase history to upsell, at a glance you know what your customer has already purchased. Log in into your Zendesk account. Select the gear icon in the sidebar to manage your settings and choose Marketplace. Browse or search for the Cartloom app. Click Install. Title: Your desired app title - will be displayed above the app in the App panel in Zendesk. Store Name: The name of your Cartloom account - just the store name, no .com, .net etc. Cartloom API Key: The API key is located in your Cartloom account. Simply login to your Cartloom Seller Admin and go to: Setup -> Restful API Copy your API Key from the Seller Admin and paste it here. 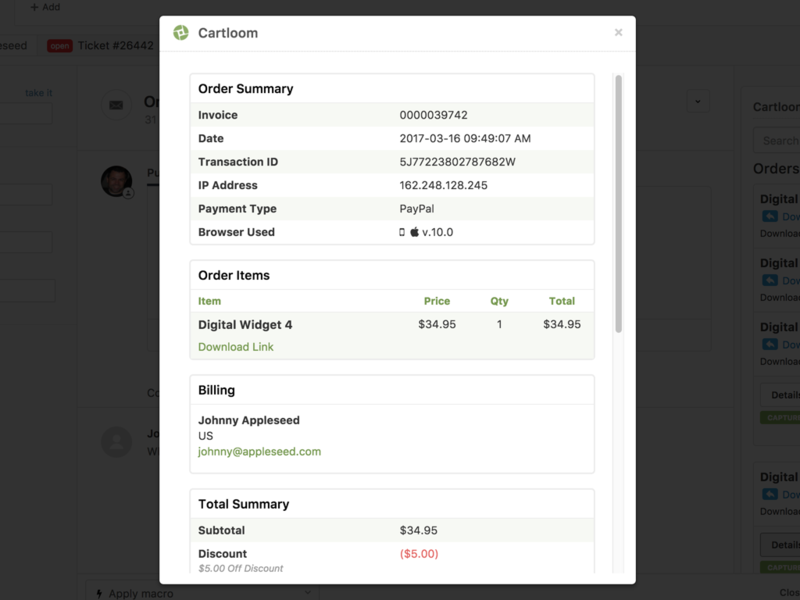 Click Install - that's it, the Cartloom for Zendesk App will appear in your App panel in agent view and order info can be easily retrieved.